The 1 day weekend Plastering Course teaches the essential techniques for successful plastering. The aim is to equip you with the knowledge and ability to plaster a wall, on your own to a good standard. The course is suitable for: both men & women, home owners, builders, beginners and improvers. No plastering experience is needed; being a personalised course means that we can start right at the beginning, or from a point that you want to improve your skills from. A general overview of the plastering process. The techniques needed to achieve a flat backing coat and a smooth finish coat. How to practice at home. How to apply what you've learnt to your own particular project. 12:45 Demonstration/Explanation of Skimming coat techniques. 1:1 Instruction / Tuition The 1 day Plastering Course is professional but informal and due to just being 1:1 means that we can go at a pace that suits you and allows you to ask as many questions as you like. All courses are 100% practical. 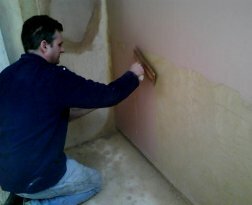 Tuition is given through a series of demonstrations and then instruction whilst you are plastering a wall. How to spread a flat even coat of plaster 2mm thick over the whole wall. the process of plastering that ensures a smooth flat surface is obtained. Guaranteed - with 1:1 tuition. The 1 day 'Learn to Plaster' course at the weekend costs £200 per person. £50 deposit is payable now. The remaining balance of £150 is payable on the day of your course. Alternatively you can make payment in full.